Associations range from small groups of individuals such as voluntary associations, to bigger organizations such as Trade associations which can consist of a large group of companies who share the same trade looking to promote the industry they are all a part off. Some Associations have their own logo or badge, others have a crest or coat of arms which is more common when it comes to alumni associations which consist of former students from colleges or universities which often have a coat of arms. 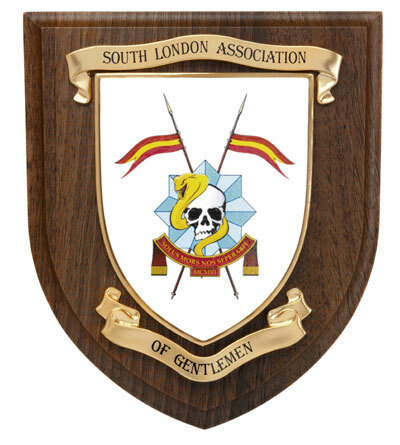 Rowan Heraldic Shields/Wall/Plaques are a unique solution when it comes to promotion, advertising, awards, gifts, and presentations etc, and also make an ideal gift/memento for members of any association. A quick note to thank you for turning our order around so quickly. The shields arrived today and have far exceeded our expectations. Photographs on a web site cannot, sadly, do justice to the quality of your finished product, which is very, very impressive. We have a number of matches against army regiments, university colleges etc coming up during the summer and I'm sure that, before the end of the summer, your product will be taking pride of place in messes and butteries across the land! We will be sure to point any resulting enquiries in your direction and I would be delighted to be asked to provide a reference as to the quality of your products and service at any time. Thank you again for turning our order around so promptly and for the very high quality of the shields you have made for us. A computerised colour visual is available free of charge upon receipt of good quality artwork/copy supplied by the client. This is an exact replica of what will be received upon order showing the full Heraldic Shield/Wall Plaque, scrolls and club badge/logo or coat of arms etc in full colour. For easy to follow steps on how to proceed with your enquiry please click here. To see the level of detail that can be achieved with our production techniques, click here.